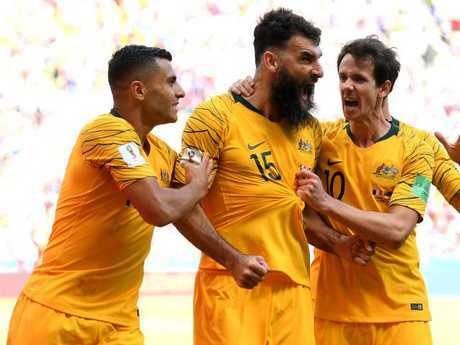 Australia's midfielder Mile Jedinak celebrates after scoring against France. 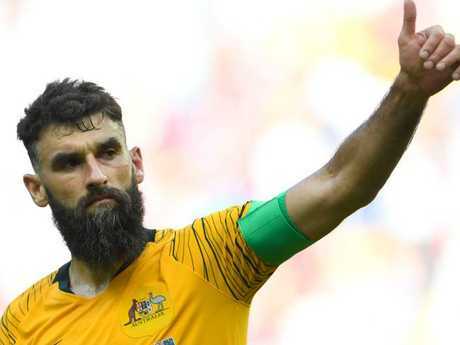 SOCCEROOS captain Mile Jedinak insists he never expects to start any game, as he waits to learn if he will be part of Australia's second World Cup encounter. 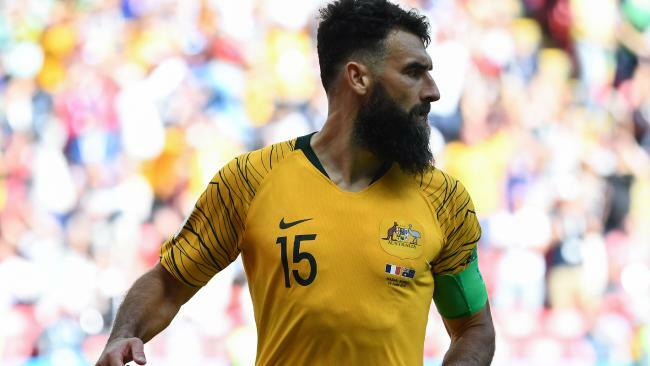 Coach Bert van Marwijk opted to include Jedinak against France - a decision handsomely repaid, despite a 2-1 defeat - but is expected to instigate a more attacking formation against Denmark on Thursday for a game the Socceroos realistically have to win. That could mean including Massimo Luongo in Jedinak's place, which could in itself be something of a gamble given the leadership role their skipper plays for the rest of the squad. The answer is almost certain to come only on the day of the game, at the team meeting where van Marwijk announces the XI to play. "I don't think you have an expectation, when you represent your country you never expect anything," said Jedinak. "When you're called upon you go and do your best. "You look forward to playing a part - I was fortunate to get picked for the France game and lead the boys out which I'm very very proud of. "For us as a collective, particularly within this tournament, it's about all 23 of us, not the individuals. "You don't say anything for certain, you never take any position for granted, I don't think you can. You don't rest on anything, you have to go out there and prove yourself all the time. "I said it to the boys, it could be your first time here or some of us have been some lucky enough to be here multiple times, but you never take anything for granted. You always prepare the right way so that whenever you're called upon you're ready." Whoever is called upon will be well aware of the high stakes against Denmark, after France's late winner on Saturday meant Australia took no tangible reward from a widely praised performance. Denmark beat Peru to be in the box seat to be one of the two teams to go through, and haven't conceded in five games. "We can't lose the game, that goes without saying," Jedinak said. "They had a positive result against Peru and we'll have to take it to them. Everyone knows what's at stake, no one's kidding themselves. We've had our first game so now everyone can understand what the atmosphere is going to be like. "We know we need a result but you have to control that emotion and do what's been asked of you. Up until this point that's been a positive thing. "Denmark have got individuals all over the park, (Christian Eriksen) has had a fantastic session at club level and for his national team. But we have to worry about us and not focus too much on individuals. "We have to turn up and put in performance that's worthy of a result against Denmark."